How old is your postcard? Do you have an old postcard and curious about its age? If the postcard is used, the most check the date on the postmark. 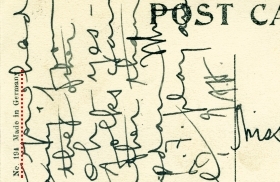 However, there are many postcards that were never mailed or that a part of the post mark is illegible or soiled. Here are some general guidelines to help determine the age range of your post card. Postcards started to be sent internationally in 1875, after the first meeting of the General Postal Union in Berne, Switzerland. 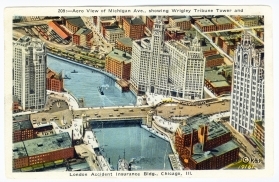 The first commercial postcards produced in the U.S. were sold at the 1893 World's Columbian Exposition in Chicago Illinois. These were the first privately printed souvenir postcards in the country. Does your card have the words "Private Mailing Card, Authorized by Act of Congress on May 19, 1898" on the back? The words "Post Card" were not printed on postcards until December 24, 1901. Cards previous to that had to have the Private Mailing Card Statement. 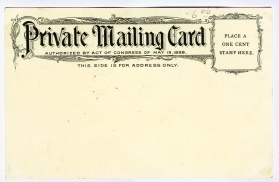 So, if your card is marked "Private Mailing Card," is dates from 1893 - 1901. Is the address side divided? 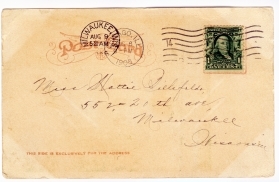 A divided back postcard (example 3) has a line down the middle, or some other indication that one half of the back is for the address and the other half is for a message. Early postcards had an undivided back (example 2). The back of the postcard was for the address only. There was often a statement that said "this side for address only." 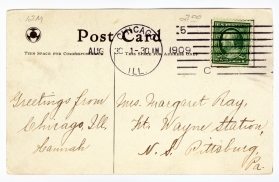 The postal service started allowing the use of divided back postcards in March of 1907. If your postcard has an undivided back, it is from 1907 or earlier. Does the postcard back indicated that it was printed in Germany? Many early postcards were printed in Germany. The German cards were of exceptional quality and are some of the best examples of old postcards available. 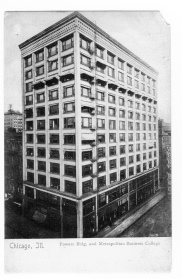 However, World War I shut down the German printing presses and cards started being printed in the United States or imported from Great Britain. If your early postcard says it was printed in Germany, it is from before 1915. Is there a white border around the picture? The White Border era dates from 1915 to 1930. The white border was introduced by the U.S. during World War I in order to save ink and estimated to have saved 20% more ink. Does the postcard paper have a texture like woven linen? 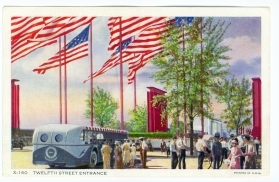 Postcards from 1930 to 1944 were printed on a linen texture paper. They also used brightly colored inks. Borders are not uncommon. Does the postcard have a shiny finish on the front, with a color photographic image? Photochrome postcards have been produced from 1945 to present. Colored borders, partial borders and scalloped edges can be found. The photochrome postcard should not be confused with Real Photo Postcards. 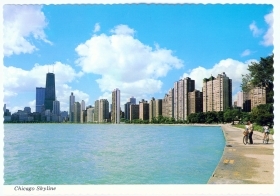 Real photo postcards are actual photographs printed on postcard paper. The vintage ones are black and white photography. There may be some indication on the back of the card about the type of photo paper used - this is often indicated by the stamp box, which will be visible if your postcard is unused. The postage stamp can help you figure out an approximate age of your postcard. There may be an exact amount of how much postage required to mail the postcard printed on the back of the postcard in the stamp box. The chart below shows the postcard postage rates and may be helpful in determining the age of your card.